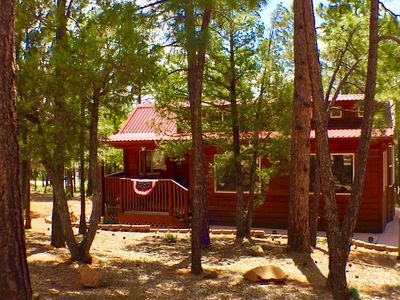 Known for its vast forest, beautiful White Mountains, and year-round outdoor activities, Show Low, Arizona will serve as a terrific destination for your next getaway! 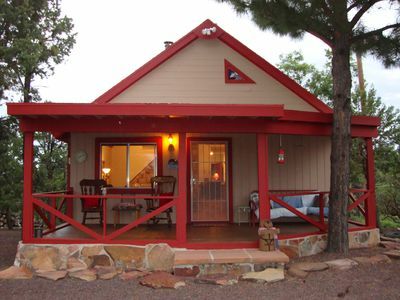 This 3-bedroom, 2-bathroom vacation rental home has plenty of room to accommodate 8 guests, making it a perfect destination for friends or family. 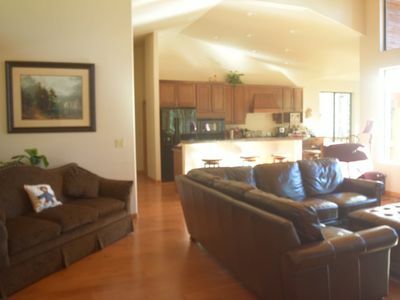 Together, you can experience all that Show Low and this beautiful home has to offer! 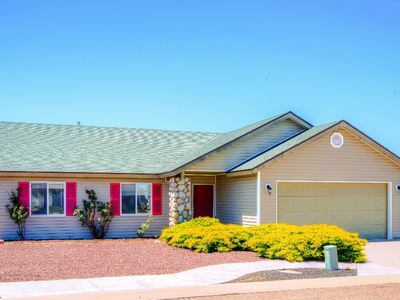 You’ll feel a million miles away from the stresses of everyday life at this inviting 3-bedroom, 2-bathroom house, nestled in a quiet neighborhood surrounded by green open fields. 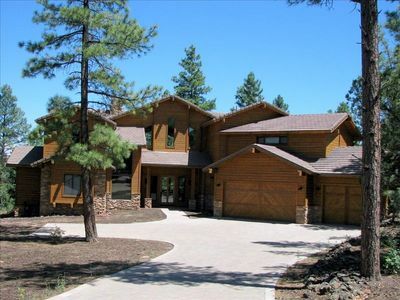 With enough room to accommodate 8 guests throughout 1,300 square feet of living space, this residence is a fantastic size for a family or group of close friends traveling together. 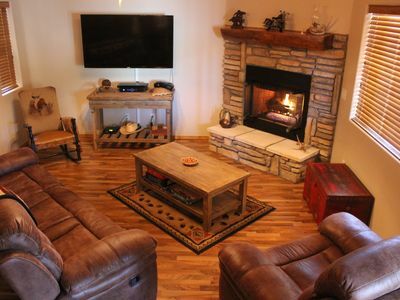 Everyone in your group will love unwinding inside the home’s welcoming interior, which exudes a cozy, rustically charming atmosphere for your vacation. 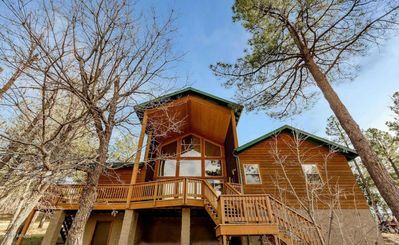 From air conditioning and a toasty fireplace to in-unit laundry machines and a fully equipped kitchen, this house offers all the amenities you need to feel as comfortable as possible. Your evenings will be best spent relaxing in the expansive backyard space, which is enclosed by a wall for privacy. Enjoy some tasty barbecue prepared on the charcoal grill for dinner. After the sun goes down, build a campfire in the portable fire pit, roast s'mores, and reminisce about the day's adventures. Once you're ready to finally call it a night, retreat to one of the peaceful bedrooms to rest up for another eventful day - sleeping arrangements include a queen-sized bed in the master bedroom, full-sized bed in the second bedroom, and a set of twin-over-twin-sized bunk beds in the kids' room. 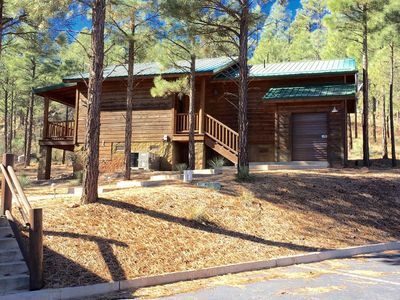 This delightful house is perfectly located to enjoy a wide variety of outdoor recreational activities! 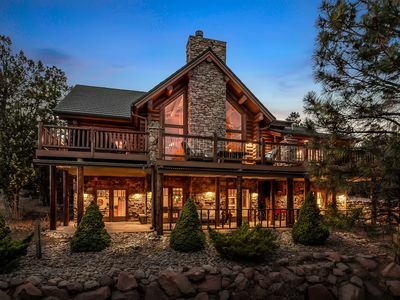 From here, you'll be within 5 minutes of Fools Hollow Lake and Show Low Lake, so you'll find endless opportunities for fishing, boating, and swimming. During the winter months, try your hand at skiing or snowboarding just 30 minutes away at Sunrise Ski Resort. No matter the season, the adults in your group are sure to enjoy a night out at the casino, located 20 minutes from the house. You'll also be conveniently located within 5 minutes of a grocery store, movie theater, gas stations, and more. 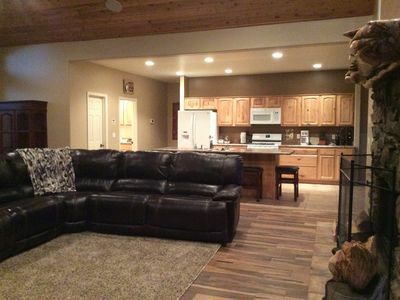 Regardless of how you spend your time here, this wonderful Show Low vacation rental home is a place you'll love returning to at the end of the day! 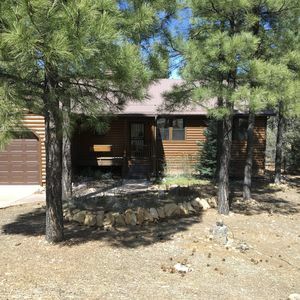 - Perfectly situated for outdoor enthusiasts - only 5 minutes from Fools Hollow Lake and Show Low Lake, and 30 minutes from Sunrise Ski Resort! 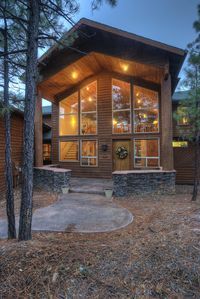 SWEET, IMPECCABLE CABIN IN THE PINES ! HIKING, LAKES NEARBY!